CVQO's annual graduation ceremony took place last weekend in the prestigious setting of RMA Sandhurst to recognise the achievements by adult volunteers in the Cadet Forces. Our adult volunteers were joined by friends and family as well as Master of the Worshipful Company of Educators Dr S Martin Gaskell and The Right Honourable the Lord Lingfield KT DLitt DL, who presented the certificates and awards to the graduates. The Lingfield Medal for Outstanding Contribution by a VQO was also posthumously awarded to Major Linda Johnston (Cumbria ACF) to recognise her amazing service and years of dedication to cadets. Her daughters Linda Howat and Stacey Ferguson attended the ceremony to accept the award on her behalf. CVQO Chief Executive Guy Horridge said of the adult volunteers: “For our graduates here today to find the time to do any of these qualifications where most have a busy work life, home life and cadet life is nothing short of amazing. 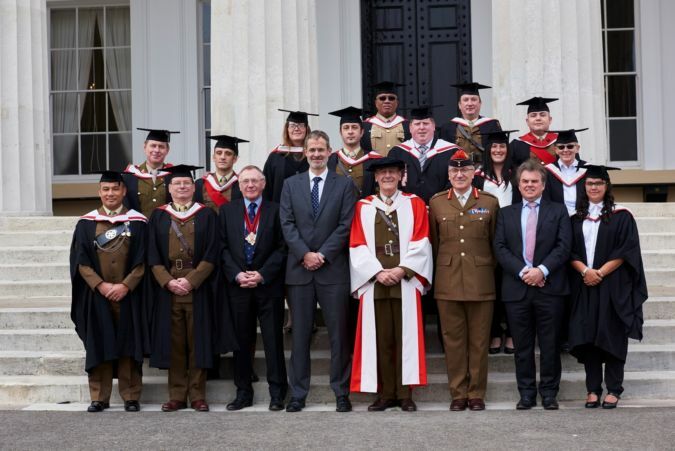 But what is really fantastic is that each and every one is setting a great example to the cadets to show them that learning can be fun and also very rewarding." Many congratulations to all of our graduates and award winners.